Make sure to get the food safe sensor if you're mixing liquids for people to consume. Arduino Yun, Arduino Uno, or other microcontroller with an analog input. If you use the Yun you can make a web page which displays the measured liquid volume. 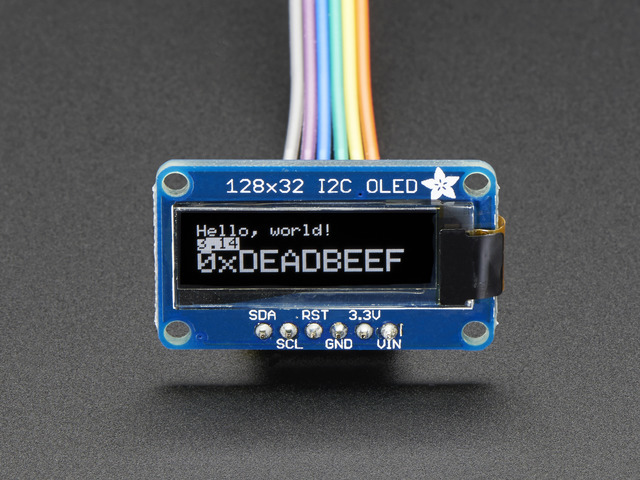 If you use the Uno or other microcontroller you'll want to add a display, like one of these OLED graphic displays. 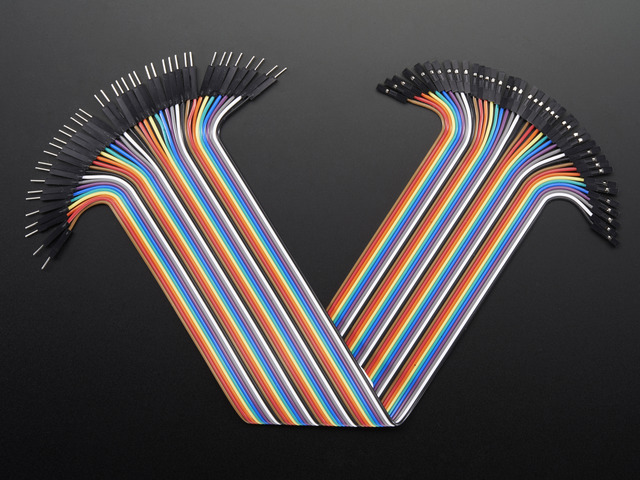 Female to male hookup wires. These will connect the sensor to the Arduino. Graduated cylinder or other container to hold liquids. For the 12" liquid sensor a 500ml graduated cylinder is the perfect size. The container should be tall enough to hold the entire liquid sensor without bending, and it should have a constant size so the volume can be calculated. Make sure to use a container which is food safe plastic or glass if measuring liquid for people to consume. MicroSD card for storing scripts and data on the Arduino Yun. 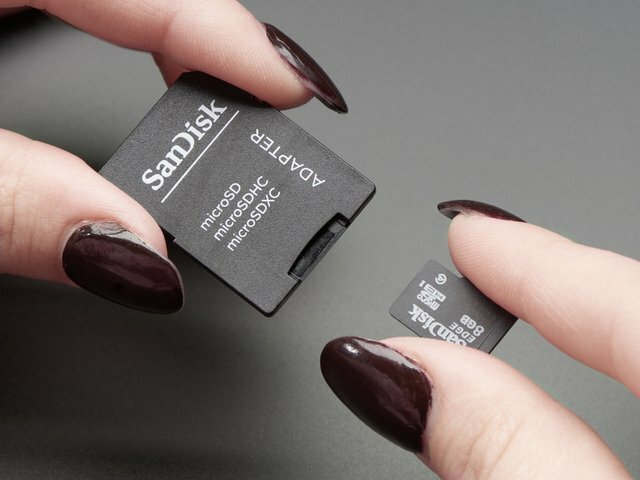 Any card with about 10-20 megabytes of free space should work. The assembly of the hardware is very simple because the eTape liquid sensor is a resistive sensor, just like a photocell. Attach one of the middle two leads to ground on the Arduino. Attach the other middle lead to an analog input such as analog 0 on the Arduino. Finally attach the 560 ohm resistor that comes with the sensor between the analog 0 and 5 volt pins on the Arduino. The outer two pins on the sensor will be unused (they're for temperature compensation in a bridge configuration). To attach the liquid sensor to a container, place the sensor against a wall of the container. Make sure the sensor hangs vertically with no bends or crimps. Only the top portion of the sensor above the MAX line can be attached to the container. The rest of the sensor must be allowed to hang freely so liquid can touch both the front and back of the sensor. Check the sensor datasheet if you need more information about using or mounting the sensor. Below you can see how I attached the sensor to a graduated cylinder with a binder clip. This clip works well as a temporary means of affixing the sensor. For something more permanent consider taping or gluing the top of the sensor to the container (remember only glue or tape the sensor above the MAX line!). Use a food safe adhesive such as silicone sealant if necessary. You can also see I bent the wires in a tall loop and taped them onto the back of the cylinder as a strain relief. Unzip the archive and load the LiquidSensor sketch in Arduino. This sketch will read the raw sensor resistance and help you calibrate for volume measurements. SERIES_RESISTOR - This is the value in ohms of the resistor you attached to the hardware in series with the sensor. This should be 560 unless you used a different resistor value. 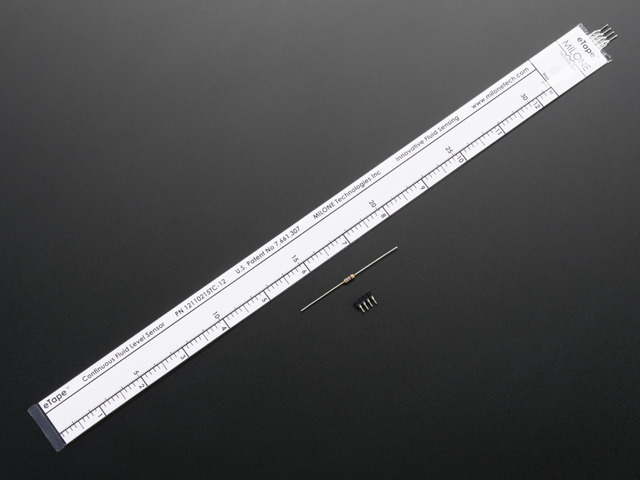 SENSOR_PIN - This is the analog input pin which is connected to the sensor. The resistance value is the measured resistance of the liquid sensor. With no liquid touching the sensor it should read a value around 1500-2000 ohms (depending on the length of the sensor). Try pressing the sensor in various locations to see how the resistance changes. If you touch near the top of the sensor at the MAX line you should see a resistance around 200-400 ohms. The resistance value with no liquid touching the sensor. The resistance value when a known volume of liquid is touching the sensor. The volume of liquid used to find the above resistance value. For example I saw my sensor output a resistance of about 1963.7 ohms when no liquid was touching it. Then I filled the graduated cylinder with 500ml of water and saw the resistance was 512.81 ohms. ZERO_VOLUME_RESISTANCE - Set this to the resistance value with no liquid, in my case 1963.70. CALIBRATION_RESISTANCE - Set this to the resistance value with a known volume of liquid, in my case 512.81. CALIBRATION_VOLUME - Set this to the volume of liquid, in my case 500.00 milliliters (you can use other units, but milliliters are what the web application expects). Save the sketch and upload again. Now you should see a calculated volume value output every second. Try filling the container with various levels of liquid to see how the calculated volume changes. If you're not using an Arduino Yun, the software setup is done and you're now able to read the volume of liquid in the container. Consider adding a display, like this small OLED, to show the measured volume! If you're using the Yun, continue on to learn about how to setup the Yun to display volume data on a web page. This guide was first published on Apr 14, 2014. It was last updated on Apr 14, 2014.